Before I start convincing you to the canX technology let me first tell you how did I come to my conclusions. For several years I worked as a system integrator doing projects on my own. Most of them were commercial and some of them were residential buildings. For example, I worked on schools, university campuses, multi-store offices, factories and even airports. You are guessing right; all those projects were KNX based. But not only. Most of them required some integration with 3rd party via BACnet, LON, Modbus or even serial. In short, I had a joy of playing with any protocol in projects on a small and a big scale. I will focus now on KNX as the core part of any of my projects and I will compare it to CANx. The initial price for ETS is not low but we can say it pays off over time. The thing which never pays off is TIME. Nowadays we want to do everything fast and easy. So how does it look with ETS? Each project is completely empty and we must spend hours on importing every device to a database and then building it one by one. At last, in ETS5 most of the devices are in an online catalogue, but not all, and then we must find each file manually on the manufacture’s page. This was the first thing which struck me while playing with canX: I got an empty project and by pressing a single button I was able to scan bus and every device was simply discovered. By another press of a button all devices were added to my database. For sure, you can build your project before you go on site and all devices are already in the tool. There is no need for an import and waste of time. Once we talk about ETS let’s finish it with its latest born baby ETS Inside. I will skip its price and functionalities but come on, who had this genius idea to develop a software which runs only on windows-based machines?? To allow a customer to make modifications in his site I must buy embedded Windows 10 PC and add a KNX interface to it. CANx has its own ‘ETS inside’ too and yes, you already guess it right, it is just another app on Logic Machine. It is a very easy and simple tool where an electrician or an end customer can configure the system or make some changes to its functionalities. Just grab your smartphone and play. A very simple step by step configuration. Let me say it again: when buying LM you already paid for it, no extra costs, no windows-based PC 😊. So far, I was only complaining about ETS so now let’s say something positive about KNX. For many years I was working with many protocols and KNX was the most robust of all of them. I experienced several strange issues but usually they were created by a bad wiring or faulty components. If somebody asks me what the most reliable bus system in the world is, I could easily say KNX is the one. Now let’s see what it looks like with canX. The medium which was selected is can FT which is the latest version of the international standard ISO 11898-3:2006. Where did it come from? Industry, automotive and space industry. Every modern car uses can, every satellite, every space rocket. I’m asking myself why didn’t they use our great KNX? The answer is simple: this technology is life critical and must be extremely reliable. There are other arguments that I will talk about later. Maybe ETS scarred them off 😉. KNX is a great medium but in modern projects I was constantly having a particular problem which was the bus traffic. Nowadays it is so easy to flood KNX bus. Even a simple residential project can flood it easily. Just set blinds to send feedback status on change of value and close all of them at once. A slightly bigger project and all of them will stop in a random position. This is a real example where blinds were digital so no issue with time synchronisation here. In modern projects where we want to monitor more and more KNX is always hitting its limits. To solve this problem, we always run an expensive IP infrastructure which is never ready on a new site. On the LM forum you can find many posts about LM and TP temperature warnings. This is nothing more than KNX chip not coping with a big amount of telegrams. This is a physical limitation of the bus. canX comes with an answer to this issue: the bus speed is improved 10 times compared to KNX, 100kbit instead of 9.6 kbit. Yes, this is when the same max cable length is used. Now let’s talk about a more important topic – security. Some time ago KNX announced the long awaited KNX secure and from now on KNX is supposed to be a secure protocol. What a marketing lie! To make KNX truly secure every single device must be replaced by a new application. Every single one must be certified which takes time and costs a lot. Can anybody show me a KNX installation with all KNX secure devices? It is enough that one device in the network does not support KNX secure then you must switch off everything. To add even more, KNX IP secure is not so secure at all. Hackers can monitor the network, record sent packages and repeat them easily. Logic Machine does not use KNX IP secure as the LM security is much better. It doesn’t only encrypt the data but also adds time validation, so nobody can reuse already sent data. Let’s not forget that out there we have millions of completely unsecured installations with standard KNX. The question is not IF, but WHEN some hackers will target KNX on a bigger scale. Don’t take me wrong, every other building protocol has the same problem. 25 years ago nobody thought about such issues but right now they are becoming critical. There were already cases where KNX system was hacked and ripped off from the installation. Here is an example case: https://www.wired.com/2014/07/hacking-hotel-room-controls/ . It is funny that the person who did it had no clue about KNX. If I was him, I could have destroyed the whole building 😉. In years to come it will be forbidden to use unsecured protocols. It is already happening in hotel sector. canX does it much better. On IP side it uses LM IP encryption with time validation. On the physical level it has 2 types of protection. Each device is password protected, you just set it up once for the entire project. By pressing a button every direct communication is blocked. This means nobody can change any configuration of the system. The second level is encrypted data. By pressing another button, we can encrypt all communication on the canX cable. As this is a new protocol we don’t have any issues with bad reputation from the past. You might have not heard it yet about KNX but you will, more often than you think. OK, I was talking a lot about KNX but I haven’t told you much about CANx. You can read all technical data here: http://canx.info/. The protocol is made in a way that every KNX installer will be able to switch to it without any additional training. We used the KNX data model to be able to merge automatically both worlds without any data conversion. This means that canX and KNX can easily coexist next to each other. This also means that an existing KNX installation could be secured by extending it by a CANx backbone. Furthermore, this also means that even if at the beginning there might be a missing product on CANx side, it can easily be combined with KNX. When we look at the installation we have the same type of topology and the same cable length. There is a difference in wiring where KNX has a small advantage here. CANx is using 10 times higher speed and due to this each device must be powered individually. KNX cable has already 4 wires so there shouldn’t be a big deal here. As a power canX needs 24V DC so no need to use a dedicated special PSU. You can also distribute the power which adds extra reliability. Another difference is the number of devices on a line which is 32 in canX. 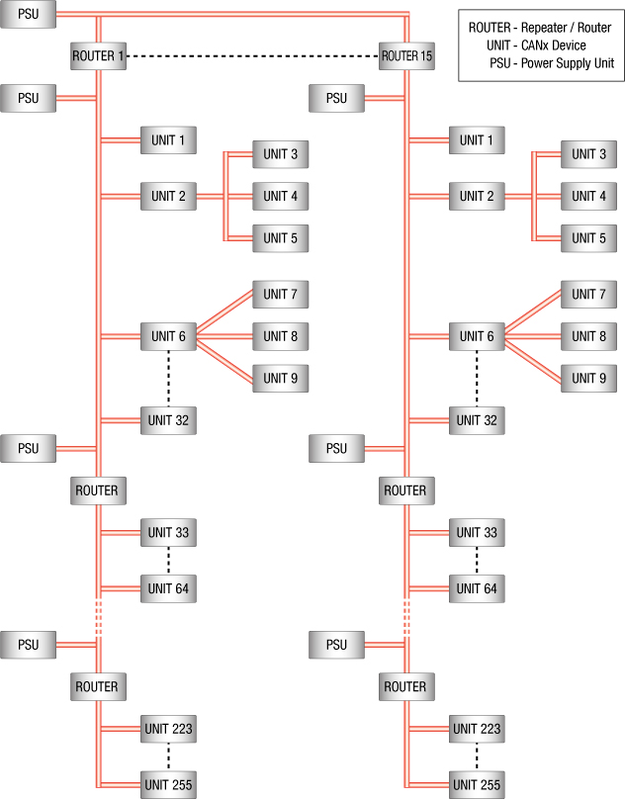 You can add a repeater and continue up to 255 devices. In KNX theoretically we can also have 255 devices but from my experience KNX cable can handle maximum one repeater. In canX I wouldn’t worry about traffic as we can do much more. For sure each line can be connected with another line via a line coupler. Filtering is also implemented to limit unnecessary traffic. Another great feature in CANx is discovery. It happened many times that I went on site and somebody else who was already working there didn’t upload the latest DB onto our server. If I had used my not updated DB and had changed anything in the project we both would have ended up not having the latest database. In canX this is not a problem whatsoever as I can simply read back all devices and its parameters from a live network. Something what I always found the most profitable for me was service and after sale, simply clean monies. During maintenance services I spent hours on scanning bus for missing devices and finding faults. What if the system could tell you straight away if there are any device errors? Yes, canX has a built-in error reporting up to single channel of a device. Logic Machine can easily notify you if there are any errors and you don’t have to do any periodic maintenance. You only act when there is a problem. On every site where possible we were trying to get remote access. It was possible on some VPN, but on some others only NAT access worked. With VPN it is nice and secure but it’s a bit hard to achieve as static IPs are expensive and most routers don’t support it. KNX allows us to use ETS only on a windows PC and we can connect to IP router only via tunnelling. Remote commissioning on KNX is possible but quite hard to carry out and very unstable. When LM acts as your commissioning tool only HTTP or even better HTTPS connection is needed. You don’t have to transfer any data over internet, only the configurations are done on the remote LM. Here a small secret 😊: I have access to all prototypes and toys EMBS is working on and there is a plan to add remote maintenance to LM via LM cloud without a need of touching the router. This is the dream solution I was always looking for. So many words and I haven’t mentioned yet the buzzword IoT 😊. Yes, let’s say why CANx fits much better into it? The whole point in IoT is not to connect everything with everything, but in representation the data that machines can understand without the need for human to translate it manually. CANx doesn’t only create nice locations of devices and objects with a proper structure but also lets you tag everything with the use of the haystack semantics dictionary. This is the most commonly used dictionary in building automation up to now. IoT still has a long way to go but CANx is already on this road. I’m sure you will point out that CANx is a proprietary technology from just one manufacture. Yes, you are right, today it is; however Embedded Systems do not want to keep this technology for themselves. Any manufacture can jump in any time and start using it and I really hope this will start happening soon. CANx is open and free to anybody. I will stop here and let you punish me for all the hate I dropped on KNX 😊. I know that some people spend their entire life working with KNX and their blood is no longer red, it is green 😉; however, when you compare these two technologies there is no other way to stress both, the positive and negative aspects. If I offended anybody I do apologis but I hope I opened your mind to other, already available possibilities. I read carefully your comments and amazingly you are absolutely right in all of them. I was looking forward for a technology like canX. I am deeply involved in the KNX business (KNX member company) and regarding Linux you have based all your products I can only say that I was born as engineer in Unix. I can compile kernel better than writing Greek which is my mother tongue. Regarding ARM just note that immediately after my Ph.D I has technical director for the development of a multi peripheral embedded processor based on ARM core along with Siemens and Lotus Engineering. The evolution of this processor is mainly used in CAN bus applications. I understand your frustration with KNX and in some part I am in line with you. I just want to tell you why I am not using LON in my building applications. The main reason is that the range of today existing devices is poor especially when considering front end devices. I also need to disclose you a secret of mine. After I finished my Ph.D (in 1993) I realized that the technology had to go towards “smart buildings”. It was one way road. That’s why basing on the know-how I gained I developed a set of devices and a system similar to KNX. Playing with embedded systems was (still is) the easy part. I discovered that the hard job was to dealing with “plastics” and molds. Marketing is also a great issue and marketing is not connected to “good engineers” but to “good salesmen” SIEMENS, SCHNEIDER, ABB. This is the great investment. Great names to a buyer’s consciousness. GDS – Embedded Systems. Just Nice words!! Finally I decided to adapt my dream by following the market leaders. In fact I turned 4 installations made with my products into KNX (EIB that time). Windows? (I hate them) Why KNX goes with Windows? Simply because this is all they know. They have invested in a windows developing team and they don’t want to outsource ETS development. Simply because windows has the huge market share. ETS inside? is for laughing (or better for crying) ETS secure!!!! Oh! my GOD 500% of overhead to the already poor 9,6Kbps KNX TP. Procol efficiency? Less than 10%. ETS2: Perfect. ETS3 Not bad but destroyed many ETS2 good features (like project split) ETS4: Rubbish. ETS5 Better rubbish. Manufacturer tool? “Who cares about manufacturers. Leave them alone” The greatest rubbish ever. KNX at the moment has penetrated to the most markets. They do great job in marketing. KNX members are all pushing this in the market. Don’t forget that you as company gained success because you provided an alternative on this successful system. You would never had this market without a KNX interface on your first LM device. Thanks a lot for your very good and constructive comment. We don’t want to fight with KNX and we are not planing ever to drop support to it ether. canX and KNX can live together for a long time and this is why we made it natively compatible. We created canX as we believe there is missing product on the market for professional installers. Everybody is investing now in to wireless but we all know this is not the way to go. I had a joy (or not) to take part of the KNX KTB meetings (KNX Technical Board). While you are there you can quickly realized that KNX ORG is not capable of moving forward fast enough to fallow the quickly developed IoT market. We are making this first step and really believe we can succeed. Well… what to say? the only question is: when it will be avaible? We are running first pilot projects and based on the feedback we will make the release in some months from now. We will be updating everybody via email, here, and forum. Very great article on canX and great job ! The world can’t be improved without innovation. – Don’t you think that KNX will be a botlleneck in a mix architecture (KNX & canX), as canX is 10 times faster ? – “Another difference is the number of devices on a line which is 32 in canX. You can add a repeater and continue up to 255 devices. In KNX theoretically we can also have 255 devices but from my experience KNX cable can handle maximum one repeater”. Please could you give more details about repeater limitations in KNX ? I am pretty sure that canX will be a breakthrough in wired communication protocole, but we must wait to see how it will be integrated into existing ecosystems. Today we have the same situation when sending telegram from IP to TP. The same solution is applied here where we send telegrams slower with a queue. The repeaters don’t limits only KNX bus. The point here is that with above 100 devices on one line without any filter you simply can flood the bus easily. It is enough to have several constant light control groups with live feedback and you are done. Many thanks for your reply. You are wright for KNX IP backbone and TP lines example. We are very excited to discover canX and it features.